Happy weekend wonderful, hope you had plenty of spiced rum and lashings of chicken. I hear that’s the best way to spend a weekend… Or maybe that’s just weekends in Stoke? Who knows. A short but sweet wishlist type post today. I’ve been tremendously lazy and off schedule with LIFE right now so trying to get some kind of organisation back in to it. What better way to start then with a new watch? WITH A CAT ON. 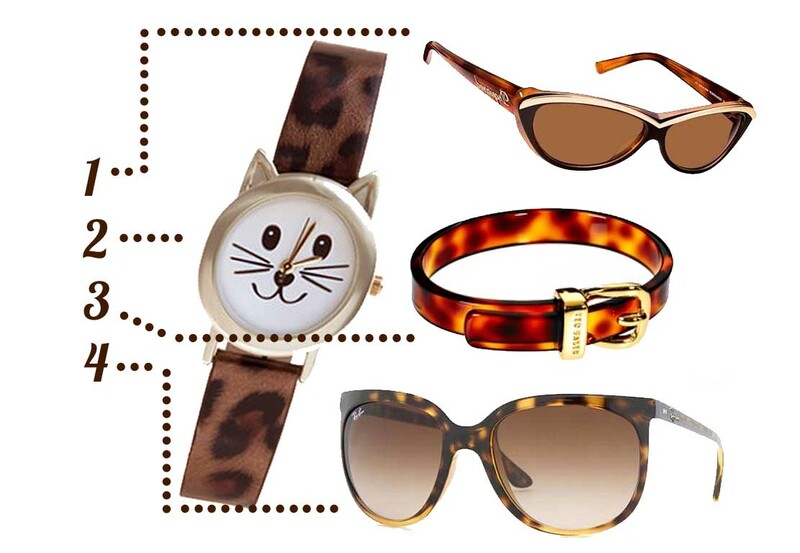 Yes, that little watch right there combines my two favourite things; tortoiseshell and cats…. Or is it leopard print actually? I’m not sure, but who care’s it’s wonderful. This watch you can find in New Look, although they don’t have the link online for me to share with you it seems. I’ve had a soft spot for tortoiseshell for many years, I’m unsure why as it’s a proper granny pattern. I have some tortoiseshell glasses already, but am constantly lusting after some sunglasses in tortoiseshell for contact lens days (which turns out to be every day actually as my prescription is so strong my glasses zoom out my eyes and make them look TINY). I really love the Ted Baker bangle in the middle there too, I have another soft spot for anything that looks like something else but is smaller and makes it more cute (does that even make sense? Ah you get what I mean!). What’s your favourite granny-esque pattern that you probably shouldn’t love but do? Paisley and Tweed are high on my list too.